Gosh, where to start? I haven’t blogged for so long, I’ve about forgot how. Thanks to all my long time readers that have emailed or left comments asking if I will ever blog again. I appreciate you thinking about me, more than I can say. I think about blogging again quite a bit, and I have good intentions about putting all those thoughts in my head down on “paper.” But, it seems time just slips away from me these days. I was sort of hoping Instagram could fill the bill, but I know it doesn’t in any in-depth way, especially since to post on Instagram you’re texting instead of typing. Good brain exercise to switch back and forth, but I am a much better typist than texter, so that pretty much ensures a short post on IG most days. You all know this post is about Jane and the fact that she is no longer with us in the sense that most people are comfortable with. I’ve got some regrets, and have also felt some relief in the last week, so I feel all of you that have “known” her since she was born need a clearer update, with more details than a headstone. I’m going to back up a little further though, and explain just how far back eating our own beef goes. By the time I was a kid in the late 50’s and early 60’s the church pictured above was used as barn/storage building on our farm. At the time this church was built in 1908 the majority of Americans lived on farms or small rural areas. In those days living on a farm meant you lived an intentional, practical life. There were no buzz words/phrases like sustainable, regenerative, energy-efficient, holistic, buy local or organic. People just lived in the most efficient manner they could muster. Doing without was a real thing, not just that you might miss a television show, or a shopping trip with a stop at the coffee drive-in, it more likely meant you were going without a meal. Most of these small farms and farmsteads raised animals for meat, milk or wool. When the animal in question had got to the end of its useful life, it would end up on the table. In my neck of the woods, cattle were the farm meat animal of choice early on in the settlement days, there was a steady need for oxen for logging, & milk cows for dairy products for the logging camps, plus the sheer size of cattle helped keep them safe from predators. As the youngest child of older parents, I grew up around a good number of older people who still practiced the old frugal ways. For comparison, my husband who is the same age as me grew up in the suburbs, and had very young parents. Despite being raised fifteen miles from each other, we were exposed to completely different things as we grew up. His folks owned a meat market, they ate fresh steak every week, we owned a farm, and ate beef every week, but definitely not steak, now it’s called nose to tail eating, but in my mind, it’s just eating what you grow, and growing what you eat. Ask my family how frugal I am with bacon, wink, wink. Some of my fondest memories are from my early childhood when a family friend, “Butch” would come over to help with the fall beef slaughter. The butchering took place in the church, and my dad would swing open the big door on the east end of the church, ready the block and tackle, and wait for the field killed steer or two to be brought in from the field. It was not a gruesome, awful thing, it was community in the finest sense, and the tasks at hand were carried out with skill born from learning from others that had come before. I was fascinated with the entire process, from the kill to the final hoisting of the quarters. My mouth watered just thinking of the liver dinner we would have the next day once the animal heat was gone. It was a treat to have fresh liver. I am sure it might turn some off to think of butchering in a church, but that church had ceased to be a church for a long time. After the building’s church duties were done, school classes were held there for a time because the nearby school had burned in a forest fire, and then finally after decades of storing hay and farm equipment that building was taken out by the Columbus Day storm. For me butchering in a church was just the way it was, I grew up thinking all things are important, and are alive and have a spirit. The trees, gardens, and creeks that surround me have a spirit that can be felt if certainly not seen. As it was, I wanted to see Jane’s spirit leave her body, and be able to be free of her maladies, and to do whatever it is that spirits do in an unencumbered way. Next: What WAS wrong with Jane? I am so glad you are back — have missed you A LOT! I knew last year when you mentioned Janes problem with calfing and you said her time was coming. I dreaded it. I am a silly suburbanite, I know nothing about living a real farming life. I will tell you that I could live that life unlike many. I will say I accept when the animal cannot contribute in one way it contributes in another. I simply will miss her pictures and to be saying her name and watching her calves. I hope it was a painless end, because I know she has a good life. Hear, hear! I really love your long posts, Nita, and have missed them, not only for keeping in touch with your life but because I learn so much. As one of those people who is confined to a computer because cell phones don’t work in our area, I much prefer the blogging. Instagram is great for the daily pictures, though. I know I can get an Instagram account on a cell phone and then post from my laptop, but for some years now I have spent 90 percent of my time on the ranch. I only need a cell-phone when hubby is out of town (he has one) and I have to go to town myself, so the expense couldn’t be justified. Now that I’m back working in health care for the foreseeable future, I’ll probably break down and get a cell phone for myself. I was so sorry to hear about Jane, but I’m with you all the way – let’s love them while they’re here and do it ourselves when it’s time for them to go. I still get teary-eyed over my old saddle mare occasionally (we put her down almost 40 years ago because she had a broken pelvis) and most recently my milk cow Maybelle. We couldn’t use her meat since we didn’t know why she went down and never got up. I always say a little prayer for the animal’s spirit and a thank you for their affection, service and the food they provide us. Got a question for you – I notice you were freezing the liver. I’ve always found it gets bitter – do you have a trick to prevent that? So glad to see you come back to share with us again. I have re-created my persona so to help you identify me, I am the one who was in West Virginia writing the Wild Ramp blog. Now in Oregon and I have several blogs, including ZeroWasteMcMinnville and CanDoRealFood. I wondered if you were still in Oregon! Thank you for returning to blogging. Please tell us the story. Most of us will never understand unless all of you tell all of your stories. We will want tissue cultured meat instead of real animals. You don’t owe us your stories, but I hunger for them. I have missed you. I am sorry about Jane, and remember my sobs over Della while turning our last compost piles in the UP of Michigan; she was an animal I never met except through your wonderful stories, which made me love her and weep when she was no more. More, please. months for beef. The cattle and sheep are completely grass fed and finished. Sometimes I will milk a cow instead of putting a second calf on her. I milk once a day and let the calf have the rest. I used to separate the cow at night and milk in the morning. Now I just let them spend their days together and after about eight weeks there’s not much milk left for me and I stop milking. I freeze a lot of milk while it is abundant and use it for cooking, once in a while feeding it to hens and dogs and lambs when necessary. I am tremendously attached to my cows and have a special relationship with each one. It is always an extremely difficult decision to ship one. Even when there is no choice it is so sad to break up that relationship.I did it last autumn and I was grumpy for weeks beforehand.Afterwards it was a big relief as it was the right decision. I am looking forward to hearing more about your farm and the growing season to come. I too am very happy to see you blogging again. As several others have said, I learn so much from your blogs. So glad you’re back….I’m reading through the back blog posts with my husband this time. He just retired and we’re hoping to move to a smaller place with acreage, enough for a larger garden, small orchard, and animals. We need your wisdom and experience! Lovely to see you back, but I get the absence thing! The older I am, the slower I seem to go. Maybe it’s an ageing thing, or maybe I just like to take my sweet time, enjoying what I do now? And there’s a lot to do on acreage. 😉 Nonetheless, I’m glad you were able to pop your head in, to share some of your stories with us again. I’ve missed them. So glad you have returned to your blog! And I look forward to reading more. gosh how I’ve missed reading you. I can only imagine the amounts of love, courage, and sense of stewardship that you had to have mustered to say goodbye to Jane. I’m not sure I have that in me. I am grateful to read such meaningful words about your life, MOH, and to call you mentor. I am so glad you are blogging and hope you do so more often. I love reading about what you do. I have followed your blog since you had Della. You are a wealth of information and I have learned from you. Thank you so much. So sorry to hear about Jane, but very glad you are blogging again. 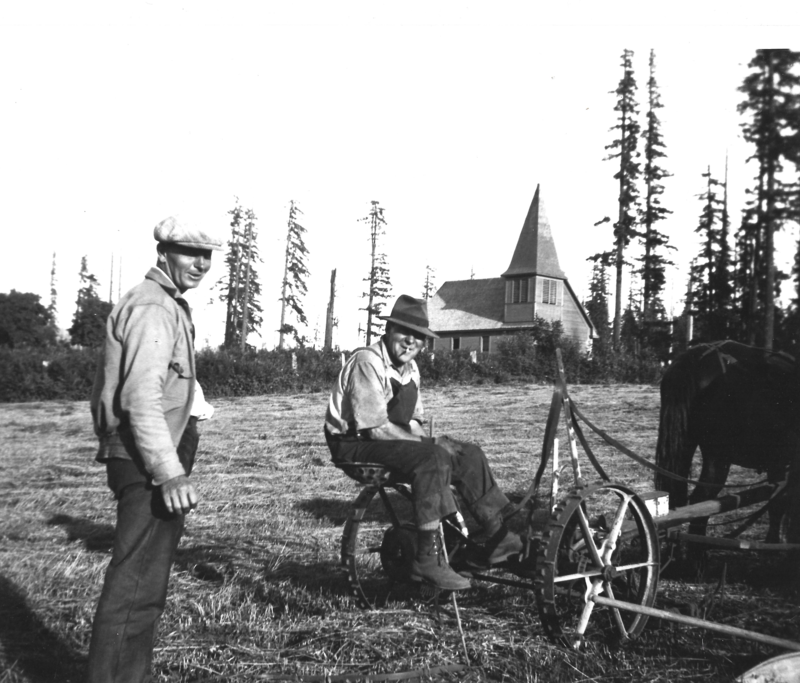 Love the old pics and the stories that go with them – especially the invaluable homesteading knowledge you are passing on to all of your followers. I am a bit envious of your family traditions – it gets tough sometimes when you have to learn everything from books/blogs/school of hard knocks! Your blog has been especially helpful to us and we are thrilled you are back. I too enjoy hearing the back stories…it’s what makes us who we are. And blogging those stories is a great way of keeping them alive – you can only regale your nearest and dearest with them so many times :). I have read your stories for years now, and I check in on IG via the desktop, so I don’t comment there. I appreciate all you share with us, you have taught me so much- mainly a way of looking at sustainability that includes my space, preferences, and my own energy and strength. Thank you for all you share. I am especially sad about Jane- and about Trace… My heart goes out to you and your family, I know they were in the care of a special group of humans during their time here. Yay! You’re back! Thanks for telling Jane’s story. I am looking forward to the next installment. So good to have you back. Something of interest in my in box! Thank you for sharing the story of Jane with us. All of it. Bless you. Can’t imagine. Thank you for having the courage to continue to share the joys, the heartaches and the lessons learned. So very happy to be reading this. You have such a gift for the written word. You painted such a wonderful picture in this first part of your story. I can’t think of a more sanctified space to be with community, working together to harvest animals to feed and nurture. Truly, deeply beautiful.